Upon exiting the highway, a local panhandler had effectively drawn my attention. It ended up with me shelling out what small change I had within arm’s reach in the car, about a buck or so. His sign was what really caught my eye. I’ve been on the lookout for inappropriate use of quotes, inspired by unnecessaryquotes.com. This particular example of unnecessary quote usage, the panhandler’s sign, although nothing to laugh at, is one worth noting for it’s effectiveness. His BAD grammar made me stop and speak with him. Had his sign been correctly written I wouldn’t have felt compelled to help him. Hi, I’m “homeless” and “hungry”. Can you “please help me”? With the quotes it literally meant that he had a nice house, had just had something to eat, and that giving him what he’s asking for won’t actually help him. I don’t know if he understood my intentions in trying to correct his sign, but he gladly took the coins I was offering him. The sign didn’t look like it was going to last too many more days. As I was driving away I realized that had responded to this call to action. He captured my attention and finally converted me. I felt taken back first; did he put those quotes in there knowing they were wrong? 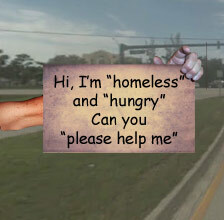 Was he copying some other panhandler’s technique? When things seem correct and in place, people don’t notice them. When something works out differently that you’d expect – then it’s an attention getter. It might not make you look professional or instill confidence, but when those things aren’t important then you might want to experiment. I’d love to know if other marketers have had success with this “skewed expectations” tactic. Please share by commenting below. Next time, grab the sign and give it to me. I’ll then pass it on to another, and that person to yet another… we’ll have the very first viral “Will work for food.” sign. I may have given the wrong email address about how to contact me the correct address is fwpierce@hotmail.com this is in responce to my 13 months on the streets in Phoenix Az. My judgement was positive ; his sign was effective! The dude was really hurtin’ so it was hard not to help him anyway, but it was his sign that got me. I’m not afraid to talk about things that other bloggers might avoid because I can honestly say that I have sympathy for people whose problems have made their lives hard to manage. Do you recall any signs that got more response than others on the streets of AZ? Do you think it would help people living on the streets to publish some kind of study as to which kind of signs work and don’t work? This is something I’ve thought of doing. I’m glad you helped him. Too many people don’t stop and help, whether it be a guy on the street or in some other form, regardless of what the sign says. My hope is that we fill the cracks in our system so that hurting dudes like this guy don’t need to panhandle to get some food. It will be cool if you discover the ultimate slogan / sign / marketing that would get people’s attention to do just that little bit more to help the poor. With masses engaged, we wouldn’t have near the problem with poverty that we do now.